It seems the Kardashians have a knack for breaking the internet on the cover of PAPER magazine. This time it’s Kylie Jenner who’s stolen the spotlight, and she’s managed to look even more plastic than ever on the cover of this month’s issue, which focuses on rising social media and Internet stars. Looking like a cross between Barbie and one of the Real Housewives of Beverley Hills, Kylie’s exaggerated look has (obviously) made headlines and caused a social media meltdown. Wow wow wow my @papermagazine COVER (?) on newsstands 4/12. This is so amazing. Photographed by @erikmadiganheck styled by @rushkabergman #YOUth (and yes my eyes and lips are edited to look bigger) ? Is the synthetic look poking fun at the industry and its tendency to try and pass overly photoshopped images as reality? Or is it a way to introduce the next generation of digitally enhanced social media stars? Or, is it neither? Mickey Boardman, PAPER’s editorial director, spoke to Mashable to set the record straight. Our concept for this issue was YOUth and we took inspiration from all things neon so we enlisted colorful personalities such as stylist Rushka Bergman and photographer Erik Madigan Heck to do something incredibly young, fun and bright. We had these crazy plastic wigs that were helmet-like paired with an ultra-bright wardrobe. 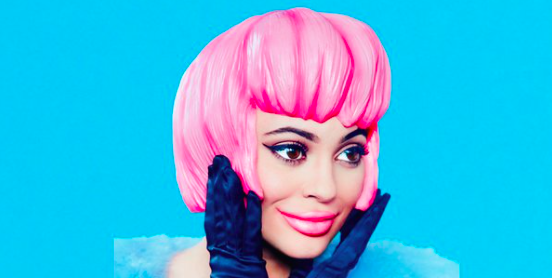 Kylie looked so cartoon that we thought it would be amazing to exaggerate and blur the lines of what’s real and fake. Or just over drawn! Well, they definitely obscured the line between reality and falseness – that’s for sure. Let’s just hope Kylie doesn’t take inspiration from this photo if she decides to get more work done – she’d end up looking like this.